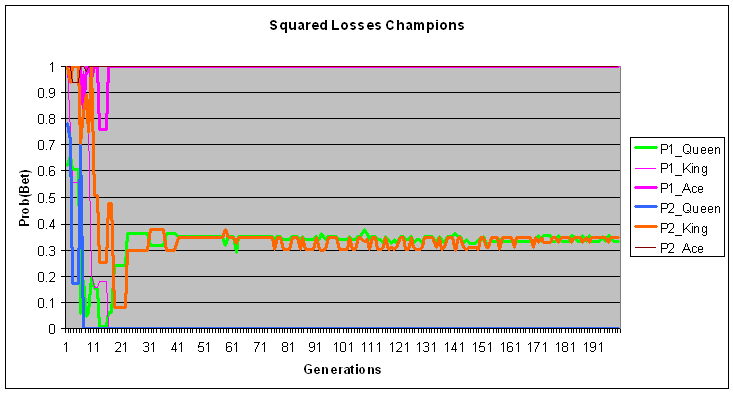 Champion parameter values using squared losses as fitness. As you can see, the fitness function does actually find the NE for the AKQ game. It stabilizes at player 1 betting 1/3 of the time with a queen and player 2 calling 1/3 of the time with a king. Curious, did you ever get your 3-player NE NN working? Looking at the squared loss fitness function in your previous code, where is the bug you speak of? I updated the code in the original article when I found the bug, but I’m just now getting around to noting the difference in results. I haven’t been able to get my 3-player NE NN working yet. I’m going to be releasing a bunch of code over the next few months in preparation for starting work on that again. I am releasing a blackjack framework today, then hopefully within a week I’ll release part 3 of the SharpNEAT tutorial, then I’ll start releasing my poker code in the weeks following that. I’m applying to PhD programs at the moment, with a plan to work on poker AI as part of my dissertation, so I’m definitely not done with it yet. Sounds good, I look forward to reading your future posts! My HUNL SNG implementation didn’t work out too well either. Most of my attempts converged to push/fold strategies. The squared loss fitness function did the same. I’ve since started focusing on other areas of poker AI, but would like to eventually get back to NE NNs.